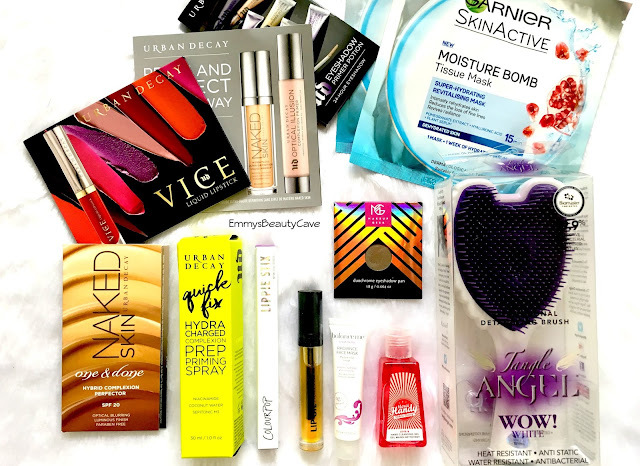 It's time for another giveaway on EmmysBeautyCave. I have been feeling really positive about my blog and I recently hit my yearly goal of 35K Followers on Pinterest which I can't believe I hit by the end of March. I do have a post on How I Got 16K Pinterest Followers in 3 Months and it is now my second highest referral site for my blog. Anyway this has made me want to do a giveaway on my blog. I have included some of my favourite products and also some extra's. Makeup Geek Duo Chrome Shadow in Havoc. 3 x Urban Decay Samples including Eye Shadow Primer, Naked Skin One & Done and 4 Vice Lipstick samples. There may be a few little added extra's too! I have the Urban Decay Spray and I am obsessed, also I am a huge fan of the ColourPop Lippie Stix. 2. Must enter via the Rafflecopter below, I have had entries in the past which aren't genuine and people are putting things like 1234 in the boxes. ALL ENTRIES WILL BE CHECKED. 3. I will contact the winner via email, if there is no reply within 7 days another winner will be chosen.